The annual session of the High-Level Political Forum (HLPF), the deliberating body for sustainable development at the UN, took place in New York from 11-20 July. The International Council for Science led an 8-person scientific delegation to the event, and was an active participant in several events during the week. Participants at the ICSU/IRD/Colombia side event on SDGs interactions. This session of the HLPF was the first one following the adoption of the 2030 Agenda reviewing early initiatives to implement the Sustainable Development Goals (SDGs). ICSU, in partnership with the French Institut de Recherche pour le Développement (IRD) and the Government of Colombia, organized a side event on 15 July to present a draft framework for understanding SDGs interactions. This framework was the subject of a recently published commentary in Nature. The event was moderated by Felix Dodds and introduced by ICSU President Gordon McBean, who highlighted the Council’s work to promote integrated science in key areas of the SDGs. Måns Nilsson from the Stockholm Environment Institute presented the SDGs framework, including its seven-point scale and the additional dimensions that should be considered when analyzing interactions in specific national or local contexts. Frédérique Seyler from IRD presented interactions between SDG 2 on agriculture and food security, and other SDGs, including for instance the impact of soil erosion in generating high levels of mercury in waterways, which in turn leads to impacts on health and ecosystems in the Amazon. Felipe Castro Pachón highlighted the importance of developing a practical approach to interlinkages and commended the work done in developing the framework. The possibility of strong trade-offs and goals that may have a cancelling effect was singled out as a major issue that governments need to tackle in the implementation of the SDGs. Pachón stressed that interlinkages need to be examined in specific national contexts. For instance, Colombia’s mining and extractive industries with their economic importance and related environmental impacts, taking into account Colombia’s specific circumstances and level of development. He stressed the value of developing a methodology that countries can use. Pachón pointed out that to apply a cross-cutting approach to implementing SDGs requires new institutional arrangements that bring the relevant ministries and agencies together. Colombia, for its part, has set up an inter-institutional commission towards this end. Participants shared information about the challenges they faced in early implementation of the SDGs. The importance of cities was mentioned, as up to 144 of the 169 targets are relevant to cities. 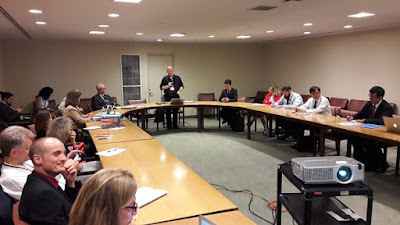 Elsewhere at the HLPF, there was much discussion about the lack of concrete tools and guidelines to support a holistic implementation of Agenda 2030 at the national level. Many acknowledged that the draft ICSU framework on SDGs was a first step in this regard, building upon the earlier ICSU-ISSC 2015 report reviewing the SDGs targets. At a science-policy interface session chaired by Hector Alejandro Palma Cerna, Deputy Permanent Representative of Honduras to the UN and Vice President of ECOSOC, there was a lively discussion moderated by Lucilla Spini, Head of Science Programmes at ICSU. The session included a presentation of the newly released 2016 Global Sustainable Development Report, an “assessment of assessments” that involved 245 scientific experts seeking to synthesize scientific evidence on sustainable development issues and strengthening the science policy interface. Members of ICSU’s CFRS and CSPR committees,programmes and members have all contributed to this report. Since the first prototype GSDR report in 2014, ICSU has been working closely with the UN and its partners to support engagement of the scientific community in this process. Spini also moderated a side event organized by UN-DESA on the 2016 Global Sustainable Development Report. A call for stronger science advisory capacities was also voiced by a number of countries, including a delegate [South Africa] acknowledging ICSU’s International Network for Government Science Advice as an initiative worth sharing with all member states.